Yesterday we ventured out in the rain to Chessington for the Merlin Annual Passholders event. We had to book tickets in advance even though it was free so that there was only a limited number of people in the park. I’ve never been to Chessington before as I lived near Alton Towers as a child and so always went there. Steffan had taken the kids in half term for one of the adventure days where there had been a couple of rides open but it was the first time they had been for most of the rides too. Lottie is 1.19m so just short of going on a large number of rides which is frustrating for her. She’s just got to an age where she wants more exciting rides…but if she saw a carousel at an event I’m sure she’d still have me wasting my money to go on it! Romeo is 1.15m so getting onto some of the bigger rides but he’s a bit of wimp when it comes to it…we do forget he’s only 4. Poor Xavier is 97cm so just missed out on the required 1m height for a lot of the rides here. We thought he was a metre…I’ve been trying out all his different shoes at home ready for Legoland next week! There are quite a few small rides and the playground and soft play are really good for this age. The animals increase the amount of time you can spend here but mine need to be that bit taller to make the most of it. It’s optimal for kids around 6-12 years old I’d say because it only has a couple of big rides. The park is heavily focused on the 1.2m range. Younger kids are better at Legoland or Peppa Pig and older are better at Thorpe Park or Alton Towers. Because it’s free on our pass I’m sure we’ll go many times this summer. Romeo loved the safari as he’s a big animal lover and wants to be an explorer. The safari was really good and really reminded me of Animal Kingdom in Florida. 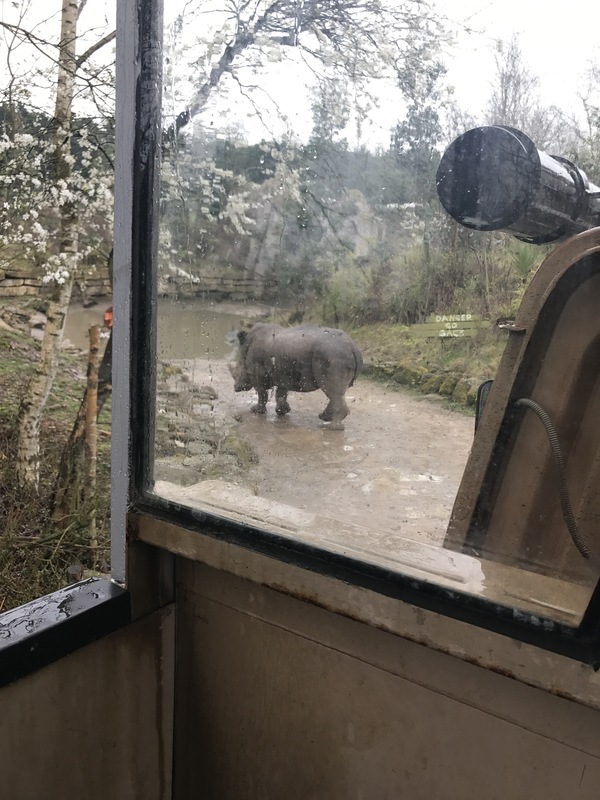 We got so close to the rhinos it was amazing…they wouldn’t let us through! He was also over the moon he was big enough for the vampire ride which is the best ride in the park. It’s annoying that it breaks down so often. We queued 60 mins and it broke down as we were getting off…the seats had to be manually operated to get us off! Then it didn’t open again for the remainder of the day…very annoying for the people behind us! Overall we had a great family day and I can’t wait to go again…hopefully when the weather is better!